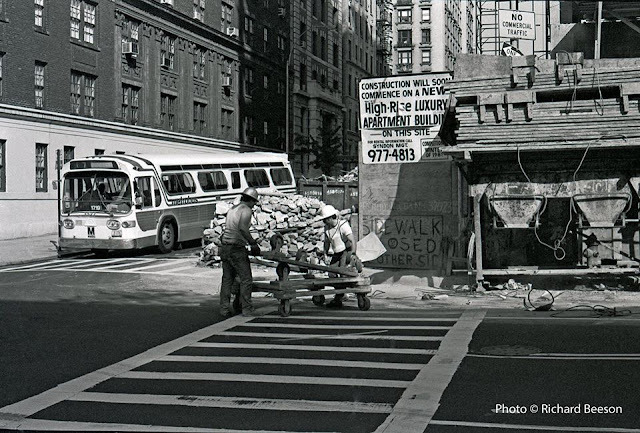 West End Avenue at 81st Street, Manhattan in 1981 (Richard Beeson). The above picture of West End Avenue at 81st Street in Manhattan caught my eye. 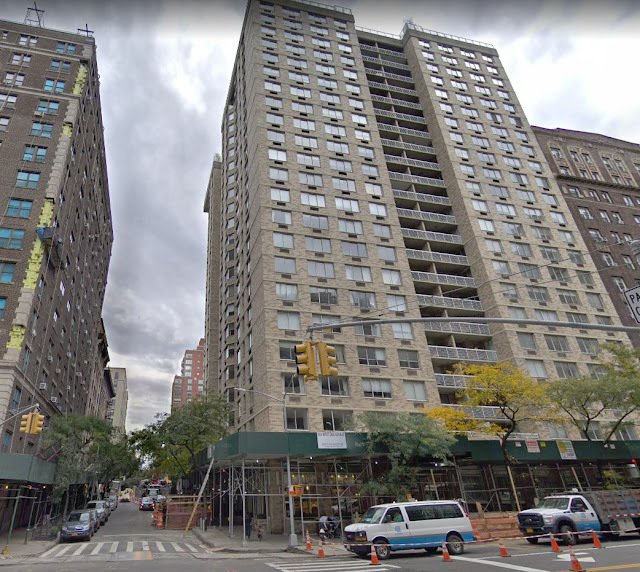 I decided to compare West End Avenue at 81st Street from 1981 to 2018. To do this, I took the picture below from Google Street View. In the 1981 photograph, we see some workmen who appear to be involved with building a "High-Rise Luxury Apartment Building" on the southeast corner. A typical city bus of the era is passing by on 81st Street. Well, we know now how that building project turned out. The "luxury apartment building" was West River House at 424 West End Avenue. West River House indeed is the building in that spot in the 2018 Google Street View shot below, and it likely still will be standing there for the next 100 years. You can see that the buildings on the opposite side of 81st Street haven't changed a bit. 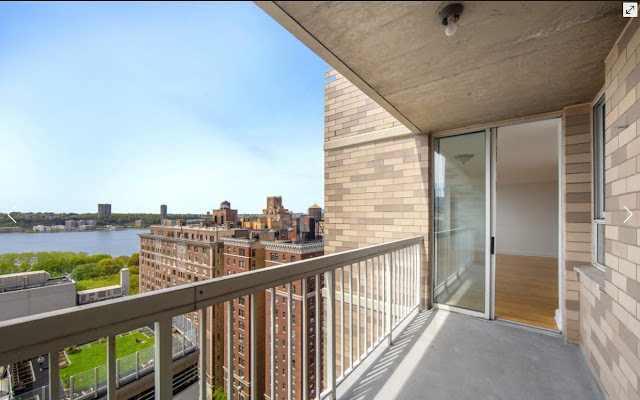 That isn't at all unusual because a good apartment building in Manhattan has an indefinite lifespan as long as it is properly maintained and has the layouts and amenities that people desire. West River House, in fact, is touted by real estate agents as "One of the few post-war properties on West End Avenue," so that gives a clue how old the other nearby buildings are. Philip Birnbaum Associates designed West River House, and it was built by Donald Zucker. The building was completed in 1982 and open for tenants by 1983. The view from West River House. West River House definitely is a prestigious building on the Upper West Side. I scanned current real estate listings, and two bedrooms start at $8350/month. A one bedroom lists at $5352 and up - when you can find one available. That's pricey even for New York, though appropriate for a top-end building. The apartments are quite nice, with ten-foot ceilings, and there are lots of little "extras." So, those workmen back in 1981 certainly did create a luxurious building. Of course, West River House is just like so many other luxurious buildings in Manhattan. But then, West River House is special. Just ask any real estate agent. Thanks for stopping by my "the more things change, the more they stay the same" series. I love history and how New York City gradually changes over time, and I hope you enjoyed this brief tour of one such change. West End Avenue ca. 2018 (Google Street View). Forget something? That awkward moment when you realize you forgot the tether for your mobile device at home.